Everyone who knows me, knows that I LOVE the internet. I love to search for new ideas, ways to green my life, things to cook and make, and the many other tidbits floating out in cyberspace. My day is not complete without at least one visit to my Facebook page, a quick look at my Twitter account and of course my email is always on. Today, I discovered a new passion… Pinterest! Have you heard about it? At first, I wasn’t sure if I “got it”, but after looking at the general boards for awhile, I soon discovered that Pinterest is FUN and a great way to search for stuff that makes you happy. I was so engrossed in looking at what other people had shared that I forgot to “repin” many things that I found. One of the first things that I repinned was a recipe for hot chocolate from A Taste of Koko – actual cups made out of chocolate filled with chocolate mousse! Click here for the recipe and find out why it is “hot” chocolate. I discovered many recipes (lots of chocolate! ), crafts, and DIY projects in my very first foray into Pinterest – and that was just in one category! I am going back tomorrow to see what other fascinating and clever things are “pinned”, and waiting to be found. So yes, I have a new obsession and I must admit – I am a Pinner! What Do You Do on a Rainy November Saturday in Vancouver? …why you go to see a movie in the morning, then you hit two artisan markets, of course! “The Descendants” (based on the novel by Kaui Hart Hemmings) is the story of Matt King (George Clooney), who finds himself the “primary” parent to his two daughters after his wife is severely injured in a motorboat accident. The movie takes place in Hawaii, which not only serves a a beautiful setting but makes up an intrinsic part of the characters’ lives. Matt must deal with the well-being of his two girls, Alexandra (Shailene Woodley) and Scotty (Amara Miller) during the aftermath of their mother’s tragic accident while at the same time decide the fate of his family’s inheritance of a vast parcel of prime land on the Island of Kauai. To further complicate the plot, he discovers that his wife was harbouring a secret that turns his world upside down. Clooney delivers a wonderful performance of the vulnerable husband, father, and everyday man, Matt King, struggling to deal with the ups and downs following a tragic accident in his life. He is supported by a stellar cast, including newcomer, Shailene Woodley who plays his sassy, strong-willed 17 year old daughter, Amara Miller, his precocious 10 year old, and veteran actor, Beau Bridges as one of the King cousins. Clooney and the rest of the cast bring the audience along on a bittersweet journey of a family re-connecting while dealing with a painful loss, through poignant moments that had me crying one minute then laughing out loud the next. I loved this film. Don’t miss it! So, it’s been a couple of months now and I’m still unemployed – still job hunting for the major part of my waking hours. You would be surprised at how long it can take to do a simple job search on the world wide web! 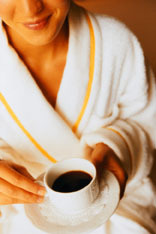 Sipping the first rejuvenating draughts of Starbucks’ Guatamala Antigua, or some such roast, I read the morning paper. Straight through to the classifieds (well, ok, I usually skip the sports page, and uh, the business section, too!). Then I reach for a pen to tackle the New York Times crossword. I have to admit, I LOVE that I am not rushed in the mornings now and I can luxuriously lay about READING the paper! Once I have finished the puzzle, I sit down at the computer and diligently surf through many job boards, stopping to apply to any and all positions I can possibly spin my talents, expertise and experience to. I’m sure that there is a better way of finding my dream job (or ANY job, for that matter), but I haven’t directed my energies into figuring that out yet – but I will. As I am digging through all the job ads, weeding them out for possible scams and unsuitable positions, I also find a few minutes to check my email, my blogs, my husband’s blogs, Facebook and Twitter! Whew! Talk about busy!! …and it doesn’t hurt to play a game or two of solitaire or hearts, does it? Every day is pajama day! Lately, I have been trying to move my family to a more vegetarian lifestyle. My husband is okay with it, but I have met with a bit of resistance from my two [grown] daughters. This means that I am constantly on the search (google, of course) for interesting, easy and filling meatless dishes. This recipe came to me in my inbox, courtesy of Martha Stewart’s Everyday Food ezine. This Lentil and Swiss Chard Soup* is quick and easy to prepare — and DELICIOUS! Even the girls loved it! 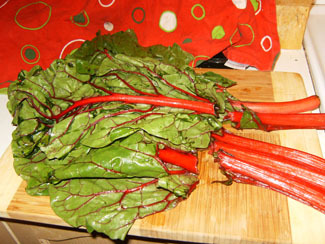 *Note: I substituted Red Chard (such a beautiful vegetable!) for the Swiss Chard. 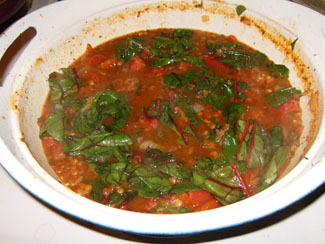 I also used dried lentils, but as the recipe points out – canned ones can be used for even faster preparation. They shall not grow old as we that are left grow old. Age shall not weary them, nor the years condemn. At the going down of the sun, and in the morning we will remember them. The fourth stanza of Laurence Binyon’s best known poem For The Fallen (1914). Click here to listen to the Choir of Westminster Abbey singing this stanza. I love to sew and I have often sewn Christmas and birthday gifts for my family. I wouldn’t say that I am an expert seamstress, but I enjoy the feeling of a job well done when I have finished a sewing project. 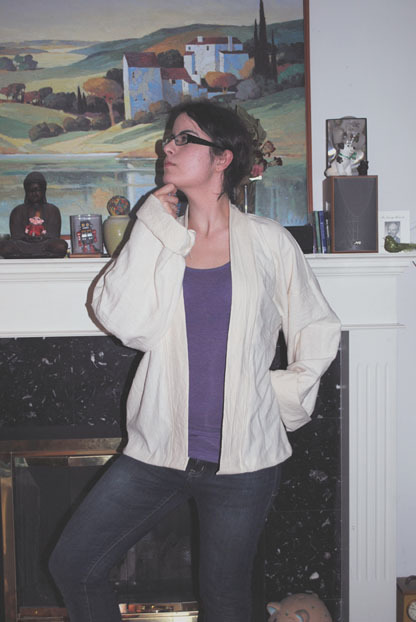 My latest attempt was to sew a jacket (using the instructions in Susan Wasinger’s book, The Feisty Stitcher). In the spirit of “recycle, reduce, reuse”, I decided to make the garment from an old curtain panel (Oh my, Miss Scarlet!). 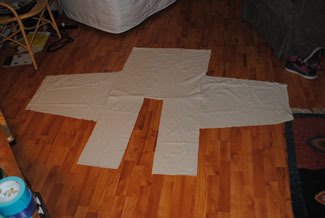 I painstakingly created the pattern following the instructions in the book and laid out the pieces on the material. 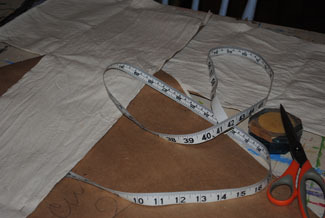 I cut them out carefully and then pinned them together, again using the book as my guide. It all went smoothly, until I came to the collar piece, which I found difficult. The instructions were no help, so I sewed it together as best I could. All in all, I was happy with the way the jacket turned out, but there are a few things I am going to tweak. In my opinion, the sleeves and the front of the jacket need to look more finished (the cuffs roll up, so the unfinished seams show, as do the seams on the front inside). I just happen to have some old striped material that will coordinate nicely with the plain beige and I will try to add this to the cuffs and make a sort of finish to the front. Stay tuned for photos of the re-do! Below is a photo of my daughter wearing the finished jacket! I’ve been looking for a job for a month now and not having too much luck. So I was quite happy on Friday, when I received a call for an interview. The time was set for the following Monday at 9:00am. The office was a fair distance from my home and as I was taking public transit, I made sure to plan my route in advance. Monday morning arrived and I left early enough to give myself a cushion of time in case I had difficulty finding my destination. 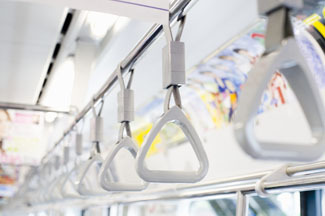 I decided that I would walk to the skytrain station and only catch a bus if one came along on my way. When I reached the first bus stop, I looked up the street to see if I could see a bus on the way. Not seeing one, I started walking. Of course, as soon as I had walked half way down the street, a bus came rumbling along, passing me. I must have looked very dismayed because the bus driver kindly stopped just ahead of me and waited for me to catch up and hop on. It was my lucky day!! I had a little more cushion time. It was a small act of kindness, but it filled me with optimism. It is always great to be the recipient of a thoughtful gesture and I was very grateful to the bus driver. I felt happy, confident and determined to “pay it forward”. On Friday, October 28, I was on my way back home from my local corner store, a quick trip for some last minute forgotten items, when I heard the laughter and joyous chorus of children’s voices. I live across the street from an elementary school and at that moment a classroom of kids was outside milling about the schoolyard, chattering and giggling. I saw that the kids were all carrying bags and focused on the ground in front of them and as I came closer I was delighted to see that the yard had been transformed into a pumpkin patch! 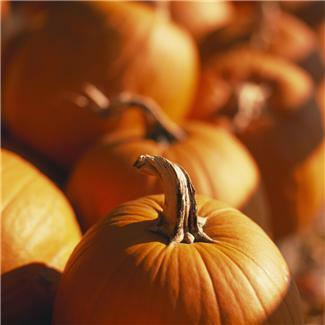 There, nestled in the bright green grass, lay twenty or so beautiful orange pumpkins, glistening in the early afternoon sunshine. The children were each intent on choosing the perfect gourd to be transformed into a spooky Jack-O-Lantern. This simple event, organized by teachers, was a beautiful thing, put on to bring joy into children’s lives, some of whom may not have ever had the opportunity to visit a pumpkin patch. It was lovely thing to witness. The best part of it all… one little voice rang out clear as a bell…”Oh, I am so happy!” That definitely made my day.